What a great gift our silver mantle clock is! Made of polished plated nickel with the base being of black painted wood. With simple classic design lines and a clear easy to read dial it works well in both traditional or more contemporary homes. The wide felt covered base gives it great stability and non slip, non scratch bonus. It really does have a feel of times gone by! 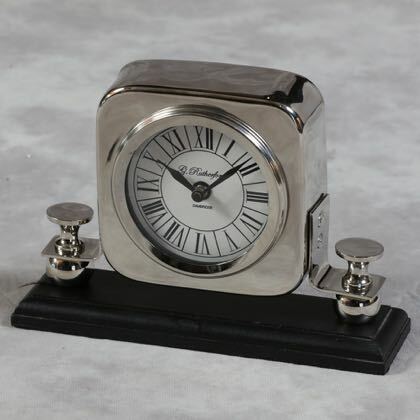 Our square table clock will fit well on a desk, display shelf or on a mantlepiece. The AA batteries and clock mechanism are at the back behind a large easy access disc that screws in and out. Use Mr.Sheen to clean it. A perfect gift. 15 x 18 x 8cm. Please do take a look around our on-line store as there are hundreds more wonderful items to be seen. If this silver mantle clock is not what you are looking for, we have a lavish selection of gifts, mirrors, French furniture, lamps, chandeliers and vintage style home accessories that will inspire you. Updating a bedroom perhaps? Starting afresh in an exciting new home? Revamping a living room? Or simply adding refreshing feature accents to your home, we are your one stop vintage shop!